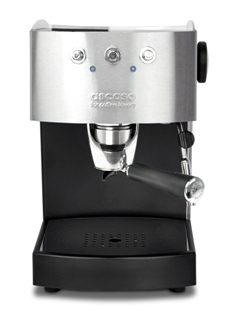 The espresso machine Arc has a comfortable size and is perfectly adaptable to our home or office. This coffee machine was designed with the medium area of the range in mind although without sacrificing neither its professional performance nor the design. And always, with great simplicity in its daily use. Produces very good espresso because of handmade aluminum casing which makes it one of the best devices that you could possibly have in your kitchen. Available with removable arm which operates with ground coffee (or tablet or capsule) or with fixed arm operating with tablet. It incorporates the latest technology in filters, with the “supercream” version, which achieves an extra creamy extraction. This special pressurised filter guarantees a creamy coffee regardless of the mixture or grinding degree used. With Auto Stop system. Two thermostats control the temperature of the coffee and steam and a resettable thermostat protects the machine from accidental overheating. The water circulates through an Inox circuit, reducing lime scale build-up to a minimum. Also, the resistances are disposed externally of the boiler to prevent damage if left without water. Emulating the professional bar coffee machines, the top apart of the machine includes an area that keeps the cups warm (cup warmers) in order for the coffee not to lose its temperature when poured into the cup. Its stainless steel and removable tray (to remove remains of coffee or water) and the design of the grille allow easy handling and cleaning. Finally, it has a detachable water tank with visible water level. Also it has a removable water tank with visible water level and blue leds. The design of the steam pipe allows making creamy cappuccinos and lattes so easily it almost seems magic.